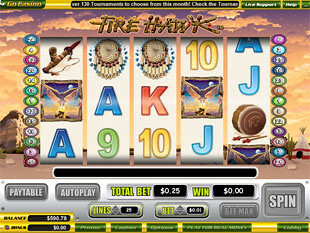 Fire Hawk Slots Fire Hawk Slots is a 5 reel 25 paylines game released by Vegas Technology. Native Americans believe that we all have our own totem that protect us and bring luck. Huge bear, fast jaguar, noble lion or pretty fox… This time you get fire hawk making your mood better and providing you with great prizes. With the top jackpot of 6,000 coins that can be increased up to 60,000 coins this slot can really work magic in case you believe and win. Such extra features as Free Spins with great multipliers help you to get the best prizes. This slot is available in no download format. Thus, you can join these fearless heroes without installing special software on your computer. The land of purple sunsets, enormous rocks and grand canyons… Try to feel the majestic atmosphere of unrevealed mysteries and astonishing treasures. 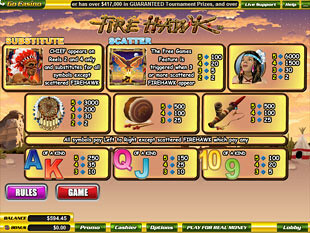 Fire Hawk will lead your way to the top awards while such icons as Dreamcatcher, Drum, Indian Chief, Pipe, Squaw, Ace, King, Queen, Jack, Ten and Nine provide you with other attractive prizes to enjoy. You can choose among such coin sizes offered as $0.01, $0.05, $0.25, $0.5, $1, $5, $10.00. The minimum bet that allows you to cover all 25 lines is $0.25 while the maximum bet of this game is $250. Thus, this penny as well as high roller slot machine can be appreciated by various players depending on their style of play. The highest jackpot is 6,000 coins or $60,000 for 5 Squaw. The second jackpot is 3,000 coins or $30,000 for 5 Dreamcatcher. The third highest jackpot is 1,500 coins or $15,000 for 4 Squaw. Chief is the wild symbol. This severe man is quite cautious and appears on the reels 2 and 4 only. But he really can work magic and substitutes any other icon except the scatter to produce more winning combinations for you. Try to get this icon during Free Spins and you will see what magic he can do with your awards. Fire Hawk is the scatter symbol. Calm water, gentle air or passionate fire… What is your element? Game is all about passion and risk. So, such rare bird as Fire Hawk can help you a lot to do your best and win quite impressive awards. Just get 2, 3, 4 or 5 Fire Hawk icons on the reels and multiply your total bet by 2, 5, 20 or 100 times accordingly. If you prefer to play with high bets that is $250 maximum for this game you can win up to $25,000 per spin. Free Spins. Get three or more Fire Hawk icons on the reels and win 20 Free Spins. This time Fire Hawk and Chief work together to bring you more incredible prizes. Thus, when Chief creates winning combination appearing on the reels 2 and 4 it also multiplies your wins by 2 and 5 accordingly. In other words, you can win 30,000 coins or $300,000 for 4 Squaw icons with 1 Chief on the reel 4. What is more, in case you get Chief symbols on the reels 2 and 4 at the same time substituting in some winning combination during Free Spins feature you multiply your award by 10. 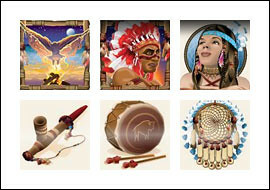 This time you can win up to 60,000 coins or $600,000 for 3 pretty Squaw with 2 Chief icons. Fire Hawk slot machine is a game full of magic and money. Wise chief helps you to win the best while fire hawk can bring you Free Spins feature with some attractive multipliers increasing your chances to win astonishing jackpot of 60,000 coins or $600,000.